IS A NATIONAL POPULAR VOTE COMING? After a bit more research I discovered that this is an issue that is both supported and opposed by members of each major political party. You have to love something that causes the parties agree and disagree at the same time. This all has to do with presidential elections and the Electoral College. In 2012, Donald Trump “...called the Electoral College a disaster for a democracy, a total sham and a travesty.” On “60 Minutes” in 2016, then President-elect Trump added: “I would rather see it, where you went with simple votes. You know, you get 100 million votes, and somebody else gets 90 million votes, and you win. There’s a reason for doing this. Because it brings all the states into play.” Remember, this is from a person who lost the popular vote. But in fact, five of our 45 Presidents have come into office without having won the most popular votes nationwide. The theory behind the National Popular Vote movement is fairly simple: “It would make every voter in every state equally important in every presidential election.” Right now with the Electoral College “winner take all” system in 48 of the states, candidates have no reason to pay attention to voters in states they feel are already a foregone conclusion. So, assuming the National Popular Vote was the law of the land, how would it work? “It would award the presidency to the candidate who receives the most popular votes in all 50 states and Washington, D.C.” This sounds simple, but could it become a reality? So, with this concept in mind, is the goal of getting enough states to agree to the Compact, thereby representing the necessary 270 electoral votes, a possible reality? The simple answer is “yes,” and that reality is closer than you may think. According to the National Popular Vote website: "The National Popular Vote bill would guarantee the Presidency to the candidate who receives the most popular votes in all 50 states and the District of Columbia. 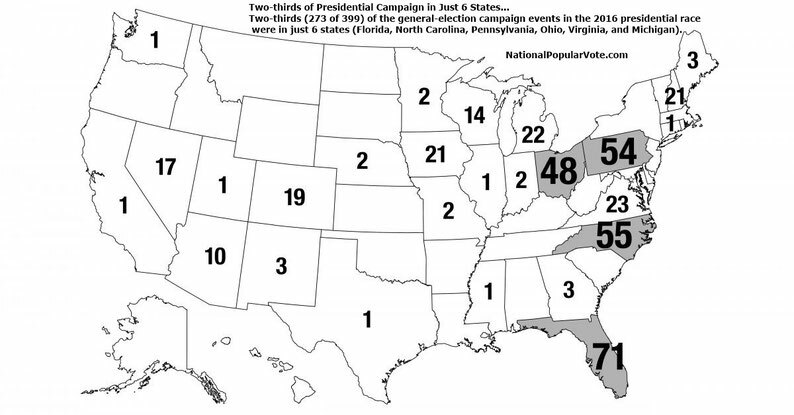 It has been enacted into law in eleven states with 165 electoral votes (CA, DC, HI, IL, MA, MD, NJ, NY, RI, VT, WA). This interstate compact will take effect when enacted by states with 105 more electoral votes. It has passed at least one house in twelve additional states with 96 electoral votes (AR, AZ, CO, CT, DE, ME, MI, NC, NM, NV, OK, OR) and been approved unanimously by committee votes in two additional states with 27 electoral votes (GA, MO). The bill has recently been passed by a 40–16 vote in the Republican-controlled Arizona House, 28–18 in Republican-controlled Oklahoma Senate, 57–4 in Republican-controlled New York Senate, 34-23 in Democratic-controlled Oregon House, and 26-16 in the New Mexico Senate.” The bottom line is with 165 votes in the bag and 105 votes still needed, the Compact is already almost two-thirds of the way home. With both Republicans and Democrats simultaneously for and against this proposal, this will be an issue to monitor in the runup to the 2018 presidential election.